The broad beans slitting machine is used to cut the graded and soaked the broad beans, and then to do further processing. it is mainly used for pre-incision processing of the fried beans, green beans, etc. 1. It is made of high-quality stainless steel, comply with the food safety and hygiene standards. After the graded broad beans soaked by the cold water, releasing the water and half cold, putting into the incision machine, through the conveyor belt into the cutter for cutting. Why Broad Beans Need an Opening Clearance? For the deep process of the broad beans and green beans, we should use the broad beans opening machine for incision, the purpose of this is supposed to make the frying easier, so that the slitted bean can absorb the flavoring thoroughly and evenly and the beans will have a good taste. 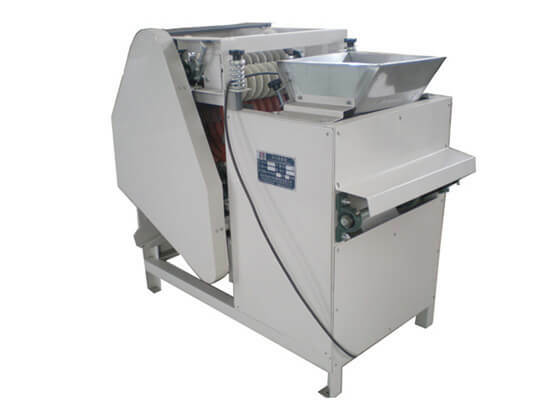 Choose Amisy broad beans opening machine can give you a great help for the further process of the beans.